Today we spent most of the day traveling. 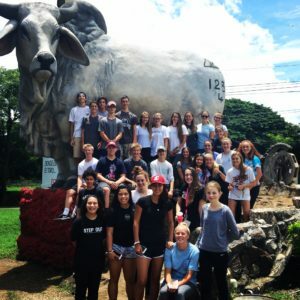 Having just got off the red eye and a 6 hour drive (with a stop for ice cream and team pic next to an unusual statue…), everyone was pretty exhausted and ready to rest. However, after consuming some quality arroz con pollo, everyone was feeling much better and happy to be on their feet. Next, we headed back to the hotel and got ready for the beach. We met up with the girls team at the beach and had a good time in the ocean diving in and out of breaking waves and body surfing. After the beach, we came back to the hotel, showered and changed to get ready for dinner. We ate at another family restaurant where we all received some of the best smoothies I have ever had. After dinner, we changed into our lacrosse gear and drove about 5 minutes to an outdoor turf field. That practice we scrimmaged 5 vs 5 and played box-like lacrosse. It was roasting hot, and extremely humid. The practice went well and everyone was drenched in sweat from the high heat and humidity. We got back to the hotel after a great long day, cleaned up, and everyone pretty much went to their rooms and fell asleep quickly. Overall it was a good first day. I am amazed by all of the different cultures here and interacting with all of the people we’ve met. I am extremely excited for the children’s lacrosse clinic tomorrow, and to get a chance to work with the young kids here.